I wonder if I am in trouble again. As Sharon tells the women in the Monday class not to put weight onto the men while following with hands on the chests. I know the remark was aimed at someone, I just do not know if it was me or not. Often when I give a bit of private tuition I ask the ladies to give me some resistance and will occasionally ask them to lean on me. I do make the point of course that it is for this time only and never to do this while in the main class, and certainly never when dancing. This is just a bit more of the conflicting advice that surrounds Tango. I like a bit of resistance, I have a need to know where the woman is. There are followers, good followers, who are very light, and while they respond well to my leads, I do not like to dance with them. I need to feel that there is a presence there; I like a small amount of weight. Don’t get me wrong, a woman who hangs on my neck, or who I have to push around the room like some overloaded wheel barrow, is not a joy to dance with, but then I do not want to be chasing her either. I have to take care; I do not run the classes. I never could. Running a big class takes a skill that I do not have, and besides I work shifts. I enjoy my one to ones with the beginners, but sometimes I can use techniques that simply would not work with a large class. I can say to a lady “lean on me” and when I fell that she has the feeling then I can return her to her axis, I can develop the feeling and know that she knows that this is not how we dance. I sometimes get a lady who simply cannot get the cross; usually this is because the weigh goes back. I have used this trick of saying “lean on me” when the feeling is understood and they are back on their own axis it all becomes clear. Trouble is of course that when someone else comes into the class and tries this, it does not work, often the leaders have not yet fully developed how to lead the cross and assume that it is the ladies fault. Sharon is very tough on the class, and sometimes it is misunderstood, but we cannot have everyone teaching at the same time. A bit of humility is needed, as you dance around the room concentrate on your body, what you are doing wrong, not your partner. I am not saying ignore your partner, you must know where they are, you must respond to what they do or where they have their weight, but do not criticise or try to teach. In the after class salon I dance with as many women as I can and what I find most annoying is when they say “but I was told to put my foot here by…….” In the class it is Sharon who is teaching, women should respond to the mans body, not his voice. 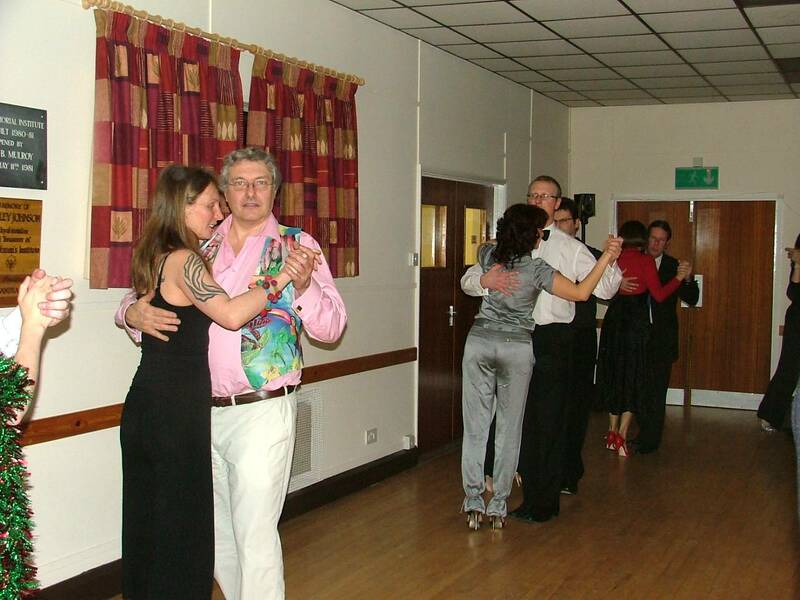 We did more Vals in the intermediates, there was a shortage of women again, so the men had to put up with me getting very close and intimate. They never dared to tell me where to put my feet, often the lead was not quite right, so I was not necessarily in the right place, but the next time they got it right. As I have said before “I am not the best follower in the world” If they can do it with me then surely they can do it with women who are always women. So my message is clear “women, go where you are led even if it feels wrong” and men “if the woman is not where you want her you be, it is most likely because you led her there”. And finally, if someone directs you verbally on the dance floor, tell them to “shut up and dance”. (I did put it a bit more crudely when asked). If you have any views on anything I have said, post a comment. I may or may not agree but open debate is always better than monologue. After all I can’t be right all the time, can I? Of course if you think I am you could tell me that as well, but I will only get more big headed. I think word is getting out there. It cannot be just the season, and the cold weather surely would have put some off, yet the numbers were up. Perhaps it was the offer of free bubbly to those who came with some sparkle, maybe it was Viv’s shoe collection, or maybe just maybe finally people are hearing what a good night we have when we all dance socially and in line of dance. 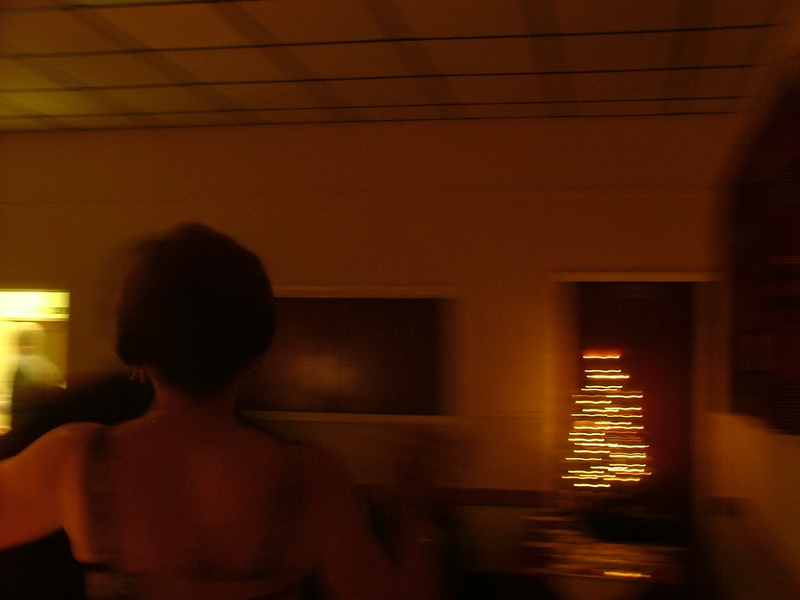 Soon we were into the dancing and it was just a whirl. I barely had time to breath between partners and Viv who complains that at other milongas she sits out too much said that she never sat down. She did have the odd break to attend to her shoes, but it left me needing to make an appointment to dance with her. We still however get the odd one who tries to teach on the dance floor and I am afraid I was rather rude, poking someone in the ribs and saying not on the dance floor. Although many will recognise my frustration, I do realise that had that been me, I would have been incandescent with rage. The guy in question seemed to hold me no grudges, so I feel somewhat humbled. I enjoy dancing with the beginners, they carry no baggage and will not try to do ganchos just because they think that is what I want. I do not try to teach on the dance floor, but sometimes a total beginner will say to me “I am a beginner and do not know what to do” I always give the same instruction “always move alternate legs keep your body in front of mine, and let me worry about where your legs are” when things go wrong, as they inevitable will with a total beginner, I pass it off as my fault. Of course they don’t belive me but why ruin an enjoyable dance with retributions. This is supposed to be fun, classes are for learning, milongas are where we relax and enjoy. Battery problems mean I did not get as many photos as I would have liked, but here is a selection, hopefully I can add more if people send them to me. We finished with a birthday celebration for Dave, is he really almost exactly a year younger than me? Must have had a hard life. Obviously Alison does not look after him as much as Viv looks after me. Perhaps I should count my blessings more. As always your comments are welcome, good or bad except for Dave who I have permission to insult with impunity. ( BTW I only insult people I like, those who I do not like just get my killer stares). OK so last night I took the Chester class. I had planned to do something about the lead and the embrace, but Sharon had asked me to go over the basic eight in preparation for the coming year. There was one guy who was fairly new, but in general everyone including the new guy was very soon doing the eight with no problems. We went on to make it a seven, leaving out the back step, but this was never going to fill two hours. I decided to ask if anyone had anything they wanted help with, and everyone either said ochos or giros. We spent some time going over the steps of the giro, until someone asked the killer question “if tango is improvised then why do we learn steps?” it was as if I had planted the question. Now I could break the moves down into their basics and show that any ocho or giro could be started or finished at any point. The lady must wait for each lead, because the man may not go the way they think he will go. I then gave them something of a demo; I chose a fairly new partner and asked her forgiveness for what I was about to do. I played Poema by Canaro, I think one of the most beautiful pieces ever written. I then proceeded to ignore the music and do every move I could think of, it was horrible, she hated it, and every one could see that she was struggling. I apologised again and asked how it was for her. Now I asked for a second chance, Poema again, but this time I listened to the music, we did nothing but walk, but changing speed and direction as the music dictated. She was happy, we looked good, our audience enjoyed it and I did not even lead an ocho. I set the class back to their tasks, telling them not to lead just giros and ochos but fill in with walking and feel the music. I picked my drink up as my mouth was dry and when I turned back everyone was dancing, not as in a class, not practicing , but just dancing. At this point I gave up teaching and just left the music on. I no longer had a class, but a group of Tango dancers. 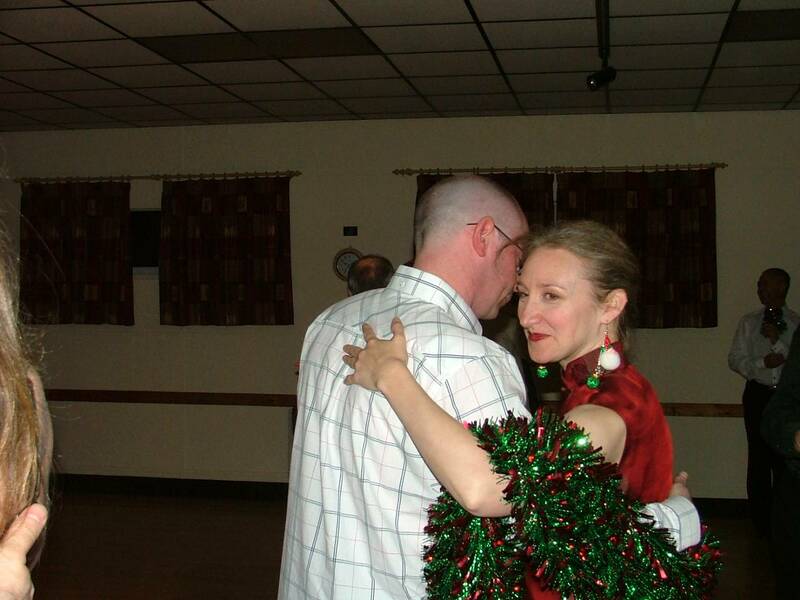 Back again at The Lantern, for the Christmas milonga. As next Thursday is Christmas day this was the last one of the year. In keeping with the new traditional thing, I turned up in a suit (very milonguero) unfortunately it was not long before I was too hot and had to remove my jacket. For my Argentine readership I should point out that it had been below freezing point the last few days, and for me this was a welcome change. Again everyone had made an effort and the night went very well. A couple who teach in Warwick had turned up to see what the scene was like here, Ricardo and Sue I think their names were. They had started their Tango in Edinburgh with Ricardo and Jenny so imediately we had some common ground. I think that they enjoyed the night, although the level is still mainly beginners. Hopefully they will turn up again some time. They were on some kind of national tour as Ricardo had told Viv about the other places that they were to visit, I am still curious as to why they selected Shrewsbury, as it is on the same night as Wilmslow. We had badgered some friends to come as well, and although they arrived late they also seemed to enjoy the night. I think the fact that the women are all followers and the music is important helps make this night. I again though met up with the same problems; many of the women with whome I danced had been learning figures and could not walk properly never mind follow a basic giro. Hopefully I straightened a few problems out, with me ending up just walking around the room with them. 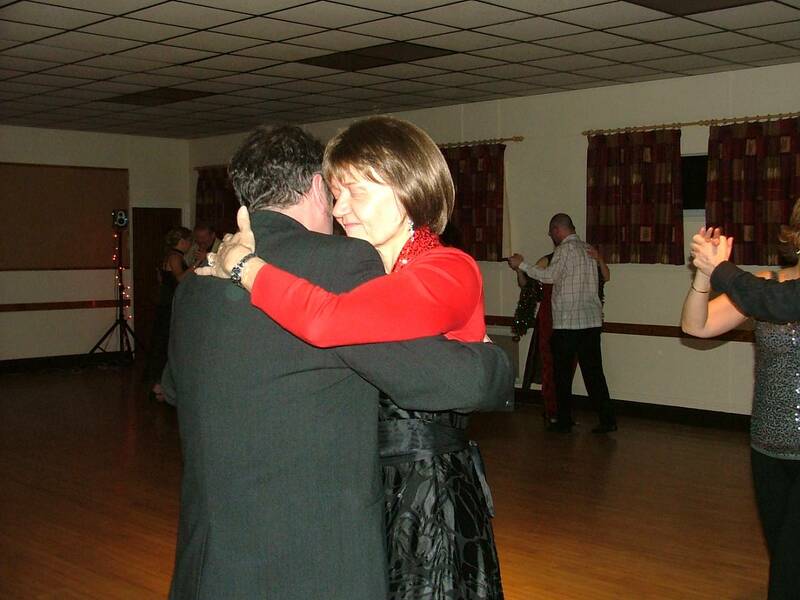 After all the beginners it was nice to dance with Sue. We started of just walking as always, but we soon got the feel and it gave me a chance to try out a few things which I could never expect the beginners to follow. I tried to lead the cadena and it just did not work, again there is no point blaming the woman, obviously my lead is not yet right although on the plus side she did understand what I was trying to do. This is the ever present problem, the only more advanced dancer that I regularly dance with is Viv, and by now she knows what I am going to do almost before I do, and so my lead does not improve. Still it was nice to try some volcadas and other things with someone new, Viv also had a chance to dance with Ricardo and as she knows all my repertoire it is nice for her to be doing something new as well. It is always a good crowd here I look forward to seeing some of them again New Years Day. As I have previously published, my posture when tango dancing is terrible. I hope my use of the present tense is now a mistake. The class we took part in on Saturday with Sven and Atilla I think has finally cured me. This miracle was brought about by the unusual teaching methods of Sven Froese. One of the unusual things he had us doing was walking around the room, just like a beginners class but the ladies would join the men, whilst the men would not break step,then leave again to join another man. He also made a point of leading with the solar plexus. You cannot do this and tuck the woman under your arm, believe me. The world has now lost it’s number one underarm dancer, I really am cured. We spent some time in the second class doing crosses in cross system and uncrossing. While Viv had done this before, I had not, at least not in a formal class. However I was not letting this distract me from my main aim which was not to improve my posture. So I must apologise to those ladies who wanted to do what was being taught, as once again I chose to ignore most of what was being said. If I got nothing else from the weekend it was worth it just for that improvement in posture. 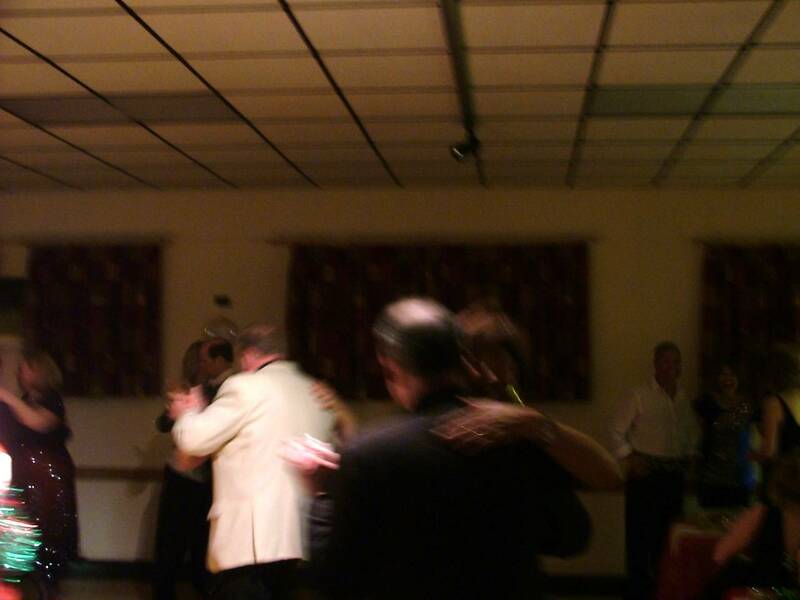 After the class we had to freeze our ears off in Wilmslow for three hours, as the legion wanted the room at Three thirty and the evening dance was not due to start until seven thirty. I did enjoy my fish, chips and peas at the Bollin Fee, although the peas were cold. Still you can’t complain at two meals for £7.10 We arrived early which gave us plenty of time to get ready, not that I needed much time to shave , change my shirt, and put on my mask. 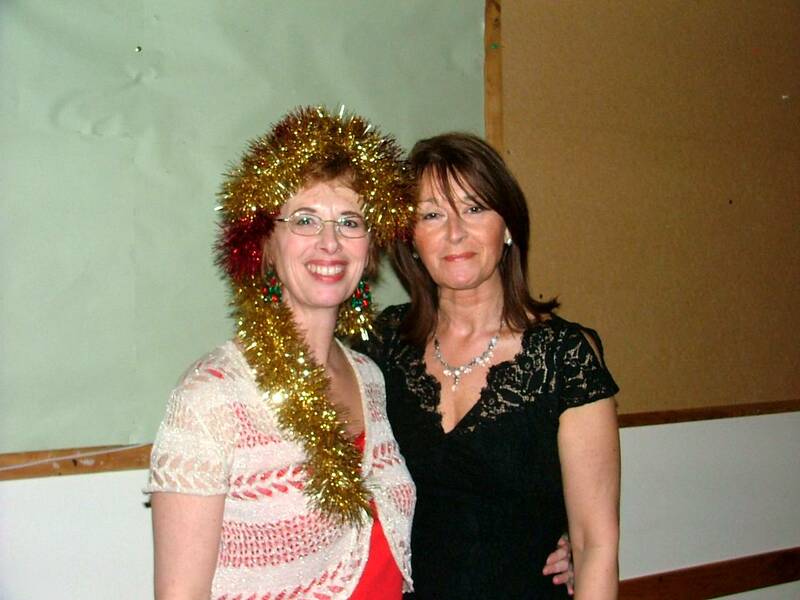 What can I say about the dance, the Christmas masked ball. As far as I could tell everyone thoroughly enjoyed it. The masks did not stay all night as I think most people got a little too hot. Live music was supplied by “Frambuesas con Nata” who as usual brought the house down. Viv managed to stay incognito, while her joke shop wig was mistaken for a new hair do. Finally I must mention the demo given by Atilla and Sven, the standard of dancing was superb as always. They gave a demonstration of pure salon tango, all improvised. It goes to show that good dancers do not need heavy choreographed routines, like “strictly” or the tourista rubbish that is starting to creep in in some of the salons. I forgot my camera again I am afraid, but I am hoping some kind person who was there will donate a few pics for me. Any offers? ?